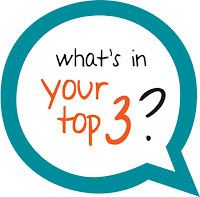 For What It's Worth: Monday musings... What's in your top 3? 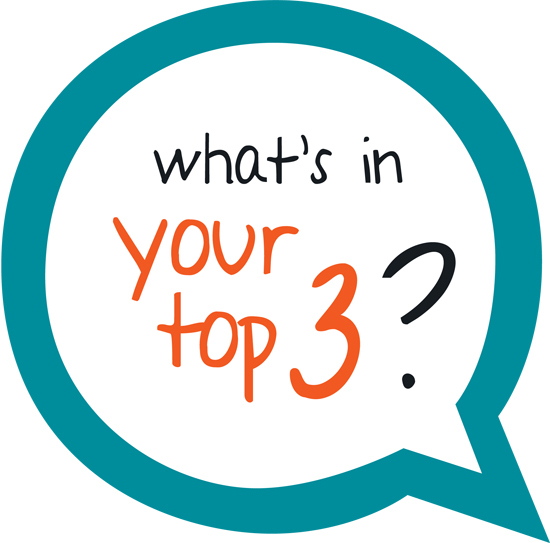 Monday musings... What's in your top 3? Brandi from Running on Words and Wine always finds the best tags and I decided to join in this one. WHAT'S IN YOUR TOP 3? I do like UF but straight up fantasy is tough fo rme. I'm always lost or bored. I hate seafood in general, so I can't even imagine trying to eat a clam or oyster. Bleh. IRONING IS THE PITS! LOL. As for your movie choices - I should be surprised but I am not. I mean, as an old follower who knows you have eclectic tastes in that department! The movie question was the hardest for me because I'm not a huge movie buff. I go to a lot at the theatre but then I'm over it. I don't watch the same movie multiple times unless it happens to be on. I don't like bread, but HOORAY FOR CHEESE AND FRENCH FRIES (I LIKE MINE CRISPY AND SPICY). <3 Yes to sneakers, too. I only have 1 pair now, but I wear them whenever I'm not too lazy to tie the shoelaces. Heh. AAAAND THE PRINCESS DIARIES! <3 The first one will always have a special place in my heart. And oh yeas! the fries have got to be crispy! Clueless is probably my favorite movie of all time. I just had broccoli as a side for my lunch and couldn't get past the first few bites. I feel like I'm starting to hate it. LOL. I should've put non-fiction on my list, too - I rarely read it. Glad you joined in on this one!! I love broccoli just not broccoli rabe which is super bitter. I don't love Clueless but it's one of those movies that I stop and watch whenever it's on and giggle. I WISH I liked more vegetables. Some are better depending on how they are cooked, but still! LOL I don't tend to read much sci-fi either (here and there though). I usually stay away from Westerns; they just don't really interest me. Oh yeah - Westerns too. I'm trying to test all the genres a bit more now that my arc pile is cleared but I still have my preferences. These are seriously my favorite posts to read :) Also I love that Clue is one of your favorite movies! What a classic :) I can watch it (and usually do!) whenever it's on. I actually extended my workout once because they had it playing in the movie room. I never set out yo watch Clueless but I get sucked in whenever it's on. Dishes and laundry man. It never ends and it's just me and my husband. Fantasy is my favorite. It always comes as a shock to me when I find out someone doesn't read/like fantasy, lol. I don't mind doing the laundry, but I hate folding it and ironing. I will avoid those for as long as possible. I get worn down by all the details lol There has been some I've liked though. I need really strong characters to connect to in fantasy - otherwise I'm lost. I'm trying to use the dish washer more but it's just the two of us. I just got done running my vacuum. I used to hate it, but now I don’t mind because I can’t stand a dirty floor. I do prefer laundry as well. Fun post, thanks for sharing more about you. 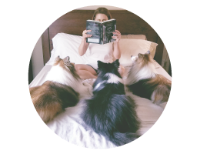 With 2 shelties and a cat, not vacuuming is not an option lol but we have all laminate flooring and only a few area rugs so it's not toooo bad. I don't read much non fiction either, anymore. And Bob's Burgers- I've never seen it! I do like some seafood. Mostly filets , scallops. I've had calimari and that falls under slimy for me. Lol I've even had someone give it to me saying it was an onion ring but I could tell the difference. I'm new to Bob's Burgers, mostly watching reruns at night but it's cute. I feel like you and I could find a restaurant to eat at quickly! And a bathroom remodel? How long will that project take? Depends if we just repaint what we have or we go all out and replace the cabinets. I don't think very long once we got going. The floors/shower was done years ago so it would just be the cabinet (bigger - more storage) and the counter. Maybe repaint walls. Oysters - ugh. I had one bad experience many years ago and that turned me off for life. One of mine is green peppers. I loathe them. Totally with you on the cheese and french fries! I feel they should both be food groups. :) Ironing - such drudgery. I don't mind green peppers but they're so blah lol DO you like the other colors - red/yellow - or are anti pepper in general? oh my goodness darling, I am adoring this post so much. I love seeing these small qualities and getting to know you a bit better. I shop for makeup and clothes, but that is because its more of a necessity than a want. But I have more workout clothes than nice clothes hehe (weird I know). Honestly...bread is my greatest weakness. So now, I try to just eat homemade baked bread since its at least better for you in the long run than anything you can buy at the store. Hope you are enjoying your week so far darling. What a hoot! I love these questions and its neat how it helps get to know you better. We have some different answers on about half, but yeah, we could hang out in our no make-up comfy sweats, cheese-eating, none ironed trip-taking selves. Thanks. I love doing & reading tags. 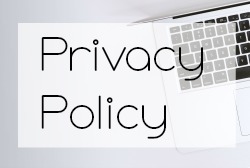 It's a great way to find a little bit more about the blogger behind the blog. I love this too and have it scheduled for next week. Mmm cheese and french fries. I don't spend money on make up or jewelry either. Can't wait to read yours! I love these tags. Bread and cheese are the best! Then I went to a local fresh seafood place when I was dating Kevin - took a big bite of my clam strip and almost puked. It was the whole clam with the belly and it tastes like dirt. Literal sand and dirt. It's gross. © For What It's Worth: Monday musings... What's in your top 3?